Peterborough United manager Dave Robertson is refusing to panic despite another miserable awayday (September 5). Posh have taken just four points from their opening six League One matches of the season following a 2-1 defeat at Southend. It was the home side’s first win in any competition this season. Goalkeeper Ben Alnwick made several fine saves to keep Posh in touch, but they had just a 90th minute goal from Marcus Maddison - his fifth of the season - to show for their efforts. Robertson blamed sloppy defending and a failure to turn possession into goals for the latest defeat - a fourth out of four away from home in all competitions this season - but also backed his side to emerge from the doldrums. “Pressure comes from within and pressure is relative,” Robertson said. “We put ourselves under pressure to win every game and we haven’t come close to doing that lately. “But there will be no panic from me or the team. We will stay positive and prepare properly for Oldham next weekend (September 12) and we will put right the mistakes that we made in this game. “I was disappointed with the two goals that we conceded today. They were sloppy from our point of view. The first goal arrived when we failed to hold the ball up front and then we still had a couple of chances to ciear the danger. “The second goal was poor marking at a free-kick, something we had warned the players about at half-time. “We also suffered because we didn’t make enough of our possession in the parts of the game when we were on top. That’s something we must do better. Robertson restored striker Joe Gormley to the starting line-up and right-back Michael Smith started his first game of the season after recovering from a back injury. Striker Conor Washington was replaced by midfielder Jack Collison at half-time with Maddison moving to a more central position up front. 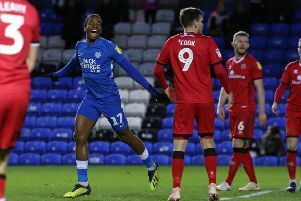 Posh have only scored the first goal in a game once this season, the 2-0 Capital One Cup win over League Two side Crawley. Robertson added: “The changes that we made at half-time worked as we started the second-half well. Michael Bostwick ht the bar and Jack Collison saw a shot headed off the line. Our luck will change soon hopefully. “We went to 3-4-3 to try and get back in the game late on. Marcus holds the ball up better in a central area and he again showed his worth with a goal. Posh midfielder Michael Bostwick collected his fifth caution in nine matches this season and will now serve a suspension.